Police responding to a domestic violence call in East Central Fresno made a bizarre discovery Saturday night. FRESNO, Calif. (KFSN) -- Fresno police responding to a domestic violence call in East Central Fresno made a bizarre discovery Saturday night. It was neighbors who called for help after hearing screams coming from a home on Turner Avenue near Belmont and Cedar avenues. Police said when they arrived at the home, a woman answered the door. They said she was crying and appeared scared, but did not want officers to come inside the home. The officers said they saw two people running through the home, and fearing someone was hurt, they entered the house. Officers said they did not find the suspects inside the home, and began searching the property. 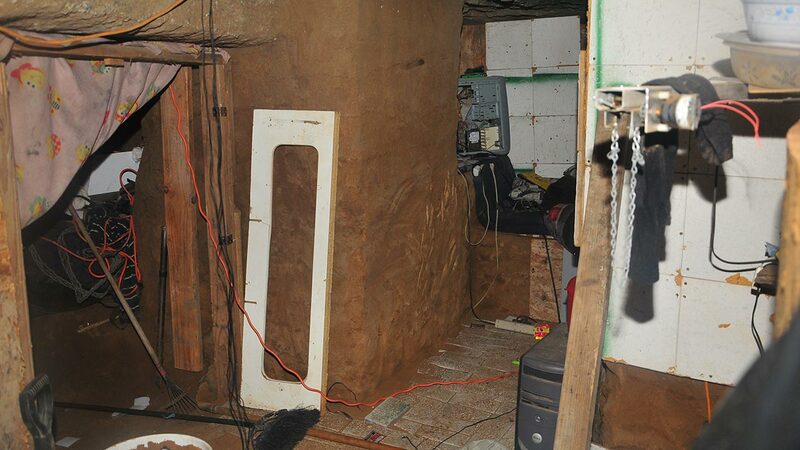 Police said while they were searching the outside of the home, they found a chicken coop that rolled away on skateboard wheels to reveal a staircase that led to an underground cave. Two men were hiding inside the cave which also had a surveillance system, tools, live ammunition, and illegal gambling machines. Police said they also found marijuana plants in the detached garage. Police arrested Daniel Marquez, Kue Vang, and Lee Khammany. All three were booked into the Fresno County Jail. Police said while they were searching the outside of the home, they found a chicken coup that rolled away on skateboard wheels to reveal a staircase that led to an underground cave.